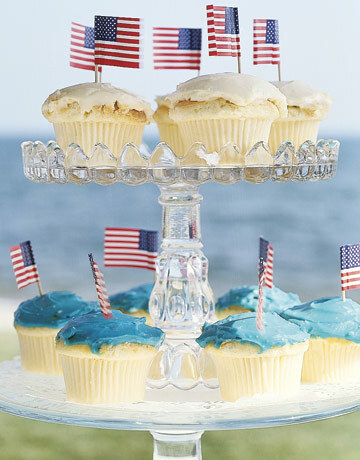 Here's wishing you all a wonderful Memorial Day weekend! 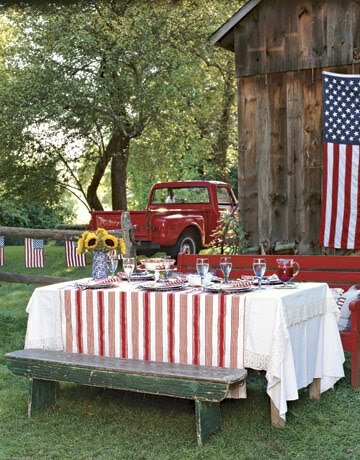 .....sharing in a patriotic picnic! 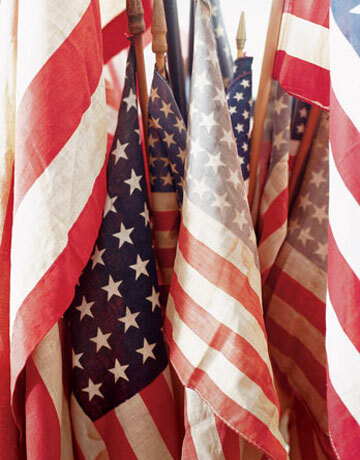 that Freedom's bell may continue to ring forth. Have a wonderful holiday, dear friends! ..... Jennifer from Studio JRU! E-mail me with your address & I'll get this out to you. Easy Organizing & Gift Idea! I got this super cute gift from one of my best friends recently, and knew I just had to share it with you! She took a fun file folder tote and simply added Scrabble letters to the front with some hot glue to spell out "IMAGINE". This is perfect for someone (or yourself!) who loves to decorate, plan parties, or get crafty! What a great way to organize and keep all of those loose tear sheets and samples for a project! for gathering all of your ideas and samples and inspiration for just one project! Then just change things out when a new project comes a' callin'!! I can't wait to fill mine up with Dream ideas for decorating my home! 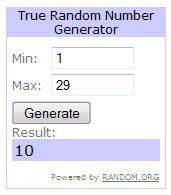 to enter the book giveaway! I am probably the only person who was asked to review this book and got incredibly excited about not only the story I was about to read within, but the fact that the art design on the hardcover book jacket comes from an 1885, blockprinted Garden Tulip Wallpaper by William Morris. Love that! Plus the fact that the soft robin's egg blue of the hardcover with the lovely gold lettering will look incredible on my bookshelf! "The Season of Second Chances" by Diane Meier follows the main character of Joy Harkness as she learns through a year of making choices and taking chances what Home, Family, and True Friendship is all about. Joy has spent her entire life yearning to feel at home. As a young woman she fled her mid-western roots for the big city of New York, certain that the excitement and whirlwind of the city would be what she needed to transform herself into the woman she had always wanted to become. When she realized that that had never materialized, she was already divorced, at a job at a university she didn't enjoy, had no real friendships and ready for anything to help her start over. She got her chance when a university in Massachusetts came knocking, and she impulsively said "Yes!". As Joy transforms a rundown old house slowly into a home, as she picks out fabrics and paint colors, as she trusts new friends, and meets others in this small town, she comes to realize that she does indeed have a Home at last! I am not a person who jumped on the Book Club bandwagon. 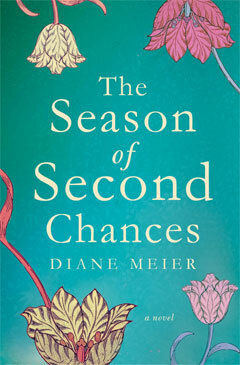 But, this book, "The Season of Second Chances", would certainly be interesting to read in a book club. The diverse characters, the many themes within (what is home, loss, a new way of looking at feminism, true friendship, etc), the fact that you may relate to and yet want to shake the shoulders of the main character in exasperation, the desire for realizing a Second Chance of your own...these would all be so interesting to discuss! Overall, I'd have to say that I really did enjoy reading this book! I really enjoyed Diane Meier's writing style, her humor she infused in her writing, the rich character development (she could probably create a series of books based on these characters), and the way she allowed her main character to learn and grow. If you would like a chance to win a copy of "The Season of Second Chances" for your own, then please leave a comment below!!! This giveaway will close at midnight on Thursday. 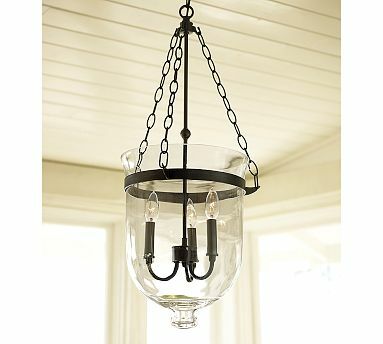 Oh, how I loved this Pottery Barn light in the catalog! It looked so beautiful online, too! I couldn't wait for it to arrive for over my kitchen table, I just knew it would be perfect for my design. But it really really wasn't. Now I've been shopping like crazy all over trying to find something with the right "look" for the kitchen. I have a few things in mind.....Gotta see what Hubby thinks now.... :) !!! Well, I changed the old bride's saying up a bit :), but I think this works very well when decorating, too! Every space in a home needs a little something "OLD" in it! It adds to the character and history of a room. Whether it's a stack of antique books, or your grandmother's china displayed, or a piece of architectural salvage, this really adds something unique and special to your space!! This gives your home a warmth that can only be created as time goes by! A lot of what we own would technically be considered NEW, but how about adding a dash of something more modern to a traditional or more vintage-filled setting? Great lighting is a fun way to add a dash of something new & updated! Add a new pillow or two in a fresh fabric, or how about just updating some of your framed family photos?!! Ok, I'm using the term BORROWED loosely here! But why not save on your budget and also get something fun & "new to you" by either doing a swap with a friend, picking up an object at a thrift store or flea market or neighborhood yard sale for a song, or even finding some treasure-in-the-rough curbside! You may be surprised!! Just add slipcovers or paint, and you've got a great new look! No matter what the current trends are, stay true to yourself! Have something in each room of your home that really TRUEly reflects who YOU and your FAMILY are! This can be expressed through heirloom pieces, candid photos of the family, a favorite color being used, a fun trend you love, etc. What did I add to my Sunroom? True -- Garden items, birdhouses, favorite things! Boy, do I ever miss that sunroom! But I've added my Somethings Old, New, Borrowed & True to each space at my new home! 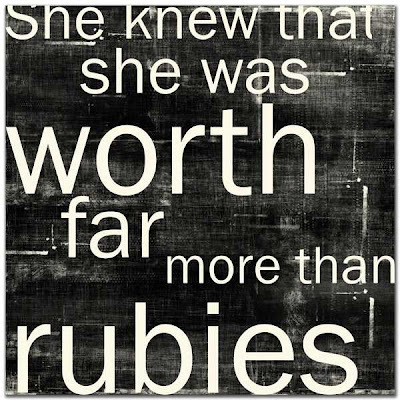 Something Borrowed & Something True! Blessings to you today, my friends!!! 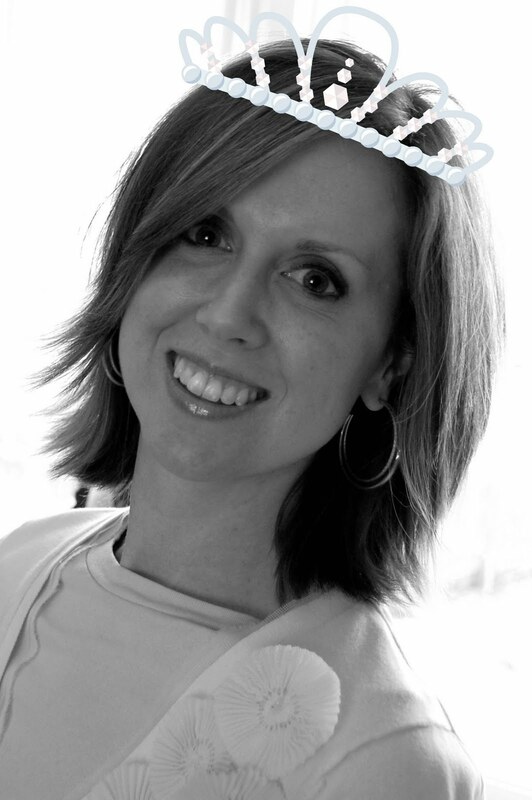 I am so happy to have Red Letter Words as a sponsor of The Blessed Nest! If you're anything like me, you want the art that hangs in your home to be unique, inspirational, and meaningful for your family! This is what Red Letter Words is all about! Beautiful, Meaningful, Faith Inspired Art! Now that's something to get excited about!! This is the lovely piece of artwork that Dee from Red Letter Words created for me! I just love it!! What a wonderful reminder for my family, especially since JOY is our Family "Word of the Year"! Go check out the artwork that Red Letter Words offers! 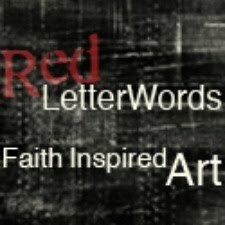 Thank you Red Letter Words for sponsoring The Blessed Nest! ps: Want to bring more traffic to your website or business? I currently have affordable advertising spots open!! Please e-mail me at: theblessednest (at) gmail (dot) com for more information! I tend to pick a project to work on (like my kitchen), then just like the dog in the movie "Up", I get distracted by something shiny in another room ("Squirrel!!") and start another project going. Then something in the next space (my dining room) looks like it really needs attention, so I plan that out, and so on & so on. Till what I'm left with is a lot of half-done projects and not a one of them actually finished! Not to mention a brain left swirling and feeling frustrated! I'm very, very, very good at this, by the way!!! LOL!! I am going to pick a room and actually finish every little thing in there before going on to another room. And by "finish", I mean I still can tweak things and change stuff around a bit...just all of the major stuff will be done. 'Kay?! Sound good? Ya with me? Great. Cause I really am going to need the accountability to make sure this happens ;)! Since I got going so strong in the kitchen, I think I'll keep going in there & finish it up! 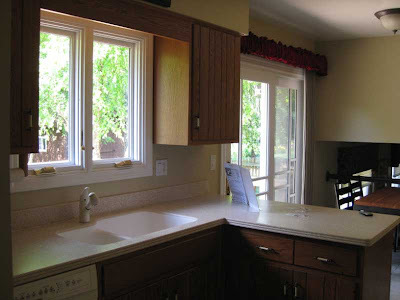 Make curtains for the sliding glass door. Change the light fixture overhead. 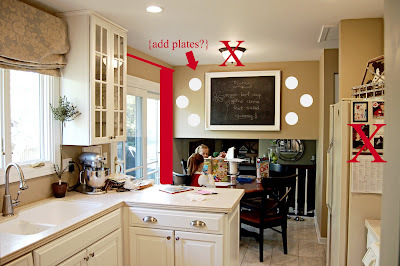 Make a "Command Central" area on the side of the fridge. Add plates by the chalkboard. Have the trim for the bottom of the cabinets installed. Add mini white subway tiles on backsplash. Get new microwave for over stove. This weekend I'll be working on my list (for the kitchen only!) and hope to try to knock out the whole thing very soon!! Do you also suffer from Too Many Projects at Once - Itis? What's your strategy for getting projects done? I'd love to hear it!! Sometimes the best family photographs are ones that don't have any faces in them! The photo above is my newest addition to the upstairs landing. It was inspired by a photo I took when my oldest kiddo was a baby of her little hand laying on my bigger hand. I wanted to re-create that with the whole family a couple of years ago, and when we had our photo taken by a professional I asked her to include one of all of our hands. I think she thought I was nuts at first, but it is truly one of my very favorite family pictures! I'd like to think that maybe someday when my kiddos are all grown up I'll still be able to see their little hands holding mine. Or maybe they'll be able to show their children their Grandmother's hand and tell them stories about what I was like. 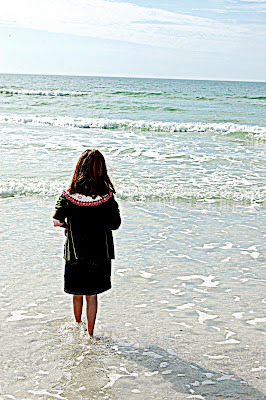 Or we could remember a chilly walk on the beach where we just had to wiggle our toes in the sand and then wade into the cold ocean! These photos allow you to let your mind wander. To remember the story behind the photograph. Or just to imagine a story of what may lie around the path's bend, or what a loving family that must be. Feet all jumbled because the family is piled together on the couch watching a favorite movie. Someone walking away from the camera. Hands on a momma's pregnant belly. Close ups of features like dimples, or eyes. Kids hands playing with a favorite toy. Do you ever take Family Photos Without Faces? 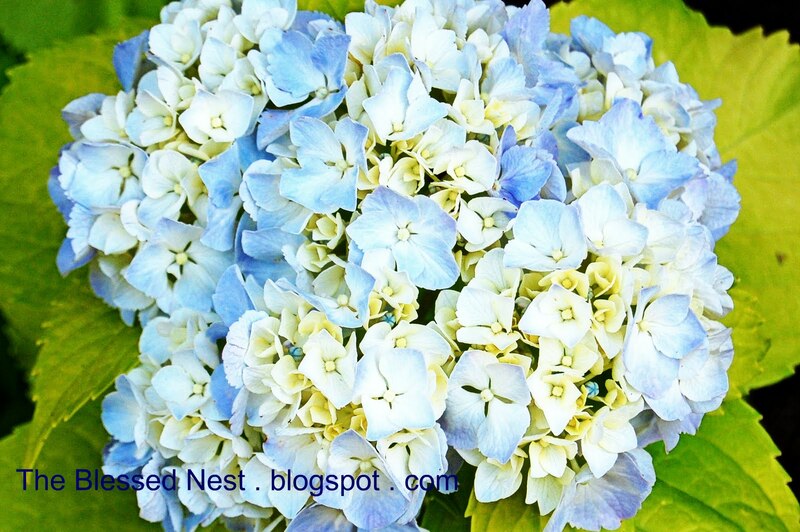 One of my very favorite flowers is the lovely hydrangea. And when it's tipped in blue...my heart skips a beat!! 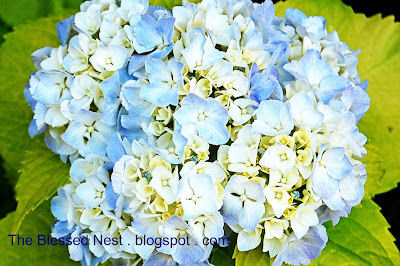 So today I'm going to find some pretty cut hydrangea to put in a vase in my home. A spot of beauty to bring a smile to my face and brighten my day! And I know that my Girls and Husband love to see fresh flowers in the house, too. :) They enjoy coming home to a place that reflects peace and beauty. Everyone can use a little cheery lift in their home. It just makes "Home" a more Welcoming, positive place to be! Greet family members at the door with a big hug and a smile! Frame a recent picture that brings good memories. Add a new Spring wreath to your front door. 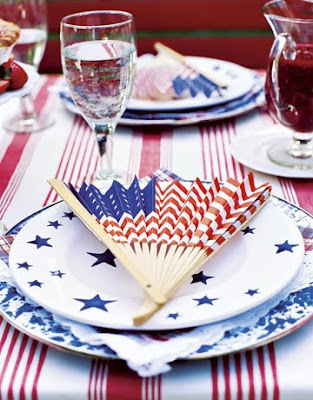 Light a candle at the dinner table tonight! Write a special note on a chalkboard. Put a single flower in a vase in everyone's bedroom. Play a fun game together. Snuggle, laugh, and talk together! Put out a colorful kitchen dishtowel. How will you make your home a more cheerful, positive, welcoming place to be? Share your idea(s) with us in the comments!